This took me a few hours on my own to achieve as its right in the rear, so I fashioned a few tools, a shifter taped to a lenght of conduit to hold the top of the bolt while I reached around with one hand to do up the 3 nuts on each side.....very painful process with lots of dropping of the socket wrench and swearing...2 hours later it was done. With this done the seat belt anchor cables where installed. 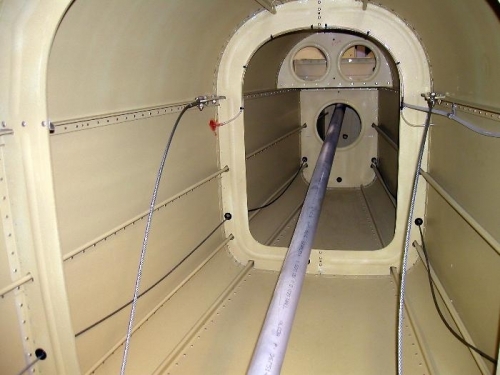 I then finished installing a large gromet in the rear spar former just above where the rear spars run through the fuselage to allow a cable bundle to enter the rear fuselage under the baggage floor. I am leaving the center access tunnel where the push pull tubes run for the aerial installation.